School children descend the steps as they return after a visit to the rock fortress in Sigiriya. 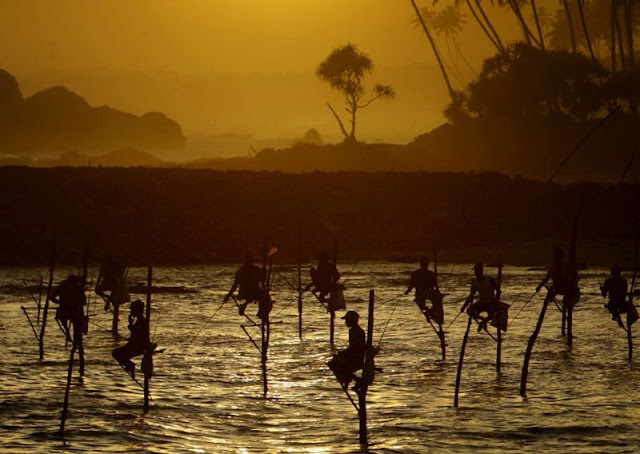 Sigiriya (Lion's rock), an ancient rock fortress and palace ruin situated in central Sri Lanka is a World Heritage Site. 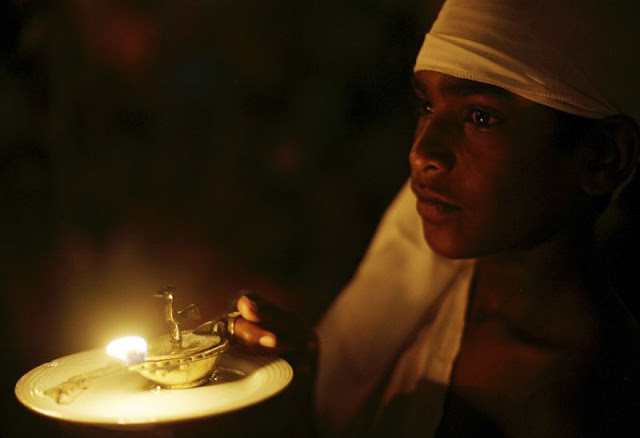 A child holds an oil lamp in front of the Sri Dalada Maligawa (Temple of the Tooth) as they take part in a procession during the Esala Perahera festival in the ancient hill capital of Kandy. The festival features a nightly procession of Kandyan dancers, fire twirlers, traditional musicians and elephants and draws thousands of spectators from around the country. 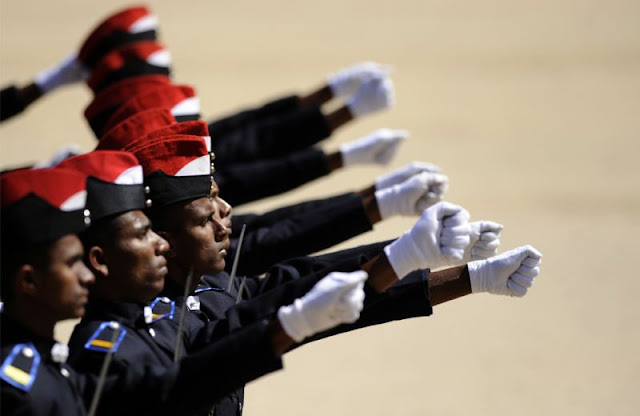 Sri Lankan officer cadets march at a ceremony for 281 new army officers' graduation at the central hill town of Diyatalawa. 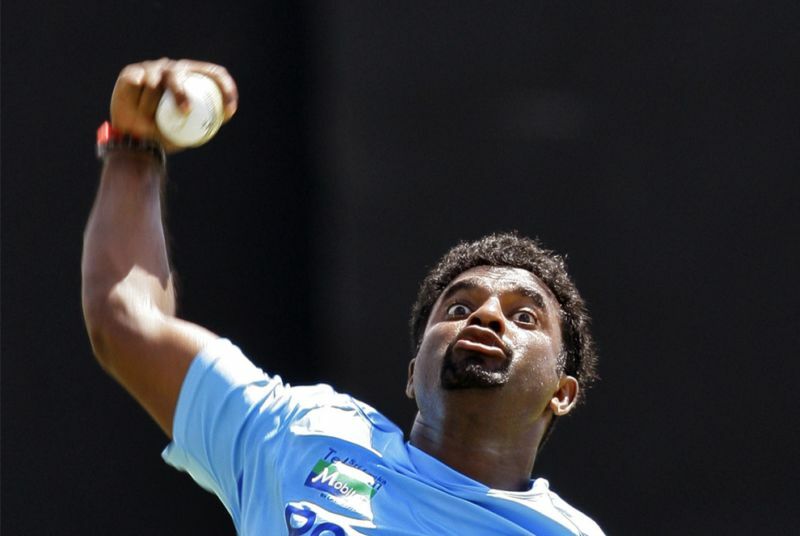 Sri Lankan cricketer Muttiah Muralitharan bowls at a practice session ahead of the second one-day international cricket match between Sri Lanka and Pakistan, in Dambulla. 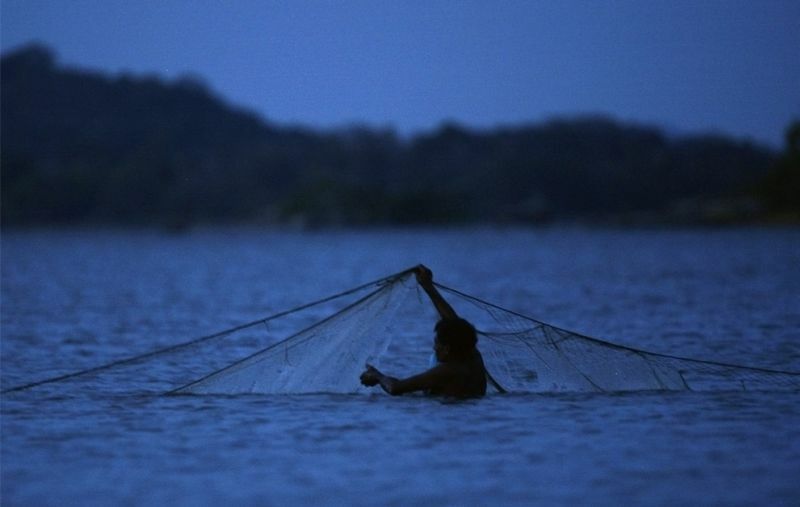 A fisherman prepares his net for the night at Kandalama Lake, near Dambulla. 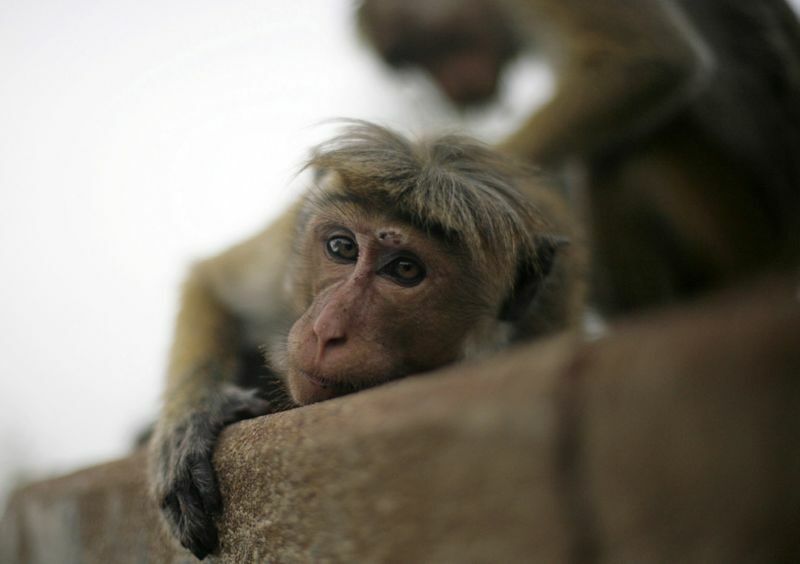 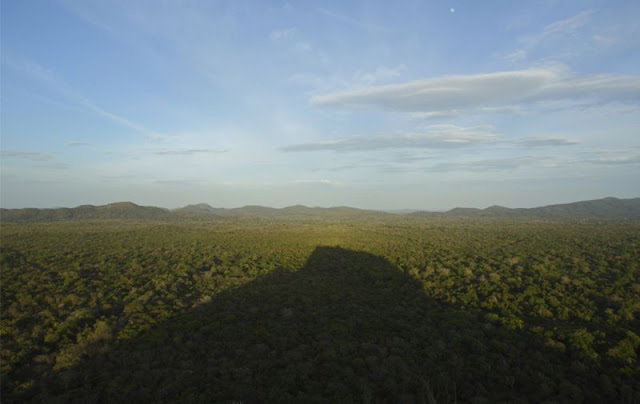 A visitor looks at frescoes on a rock face at the rock fortress in Sigiriya. 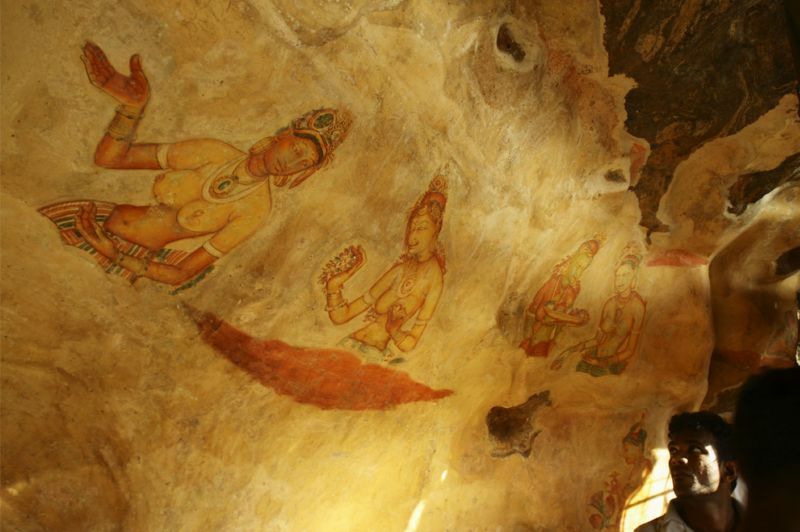 Sigiriya (Lion's rock) is a popular tourist destination renowned for its ancient fresco paintings. The shadow of the rock fortress is seen on the forest canopies below, in Sigiriya. 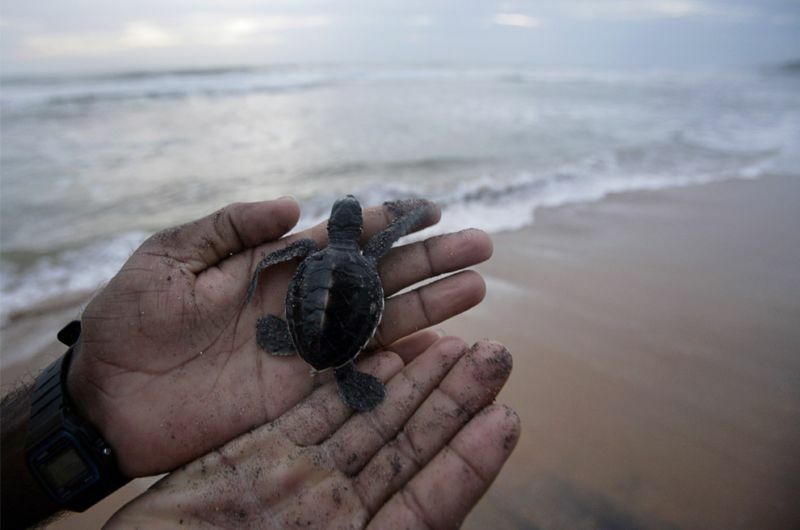 A man displays a 3-day-old green turtle hatchling before releasing it into the ocean at a turtle hatchery in Kosgoda, north of Galle. Of the world's eight turtle species, Sri Lanka is home to five. Turtle hatcheries along the coast provide a way of earning a living for the people running them and also help combat the poaching of turtle eggs. 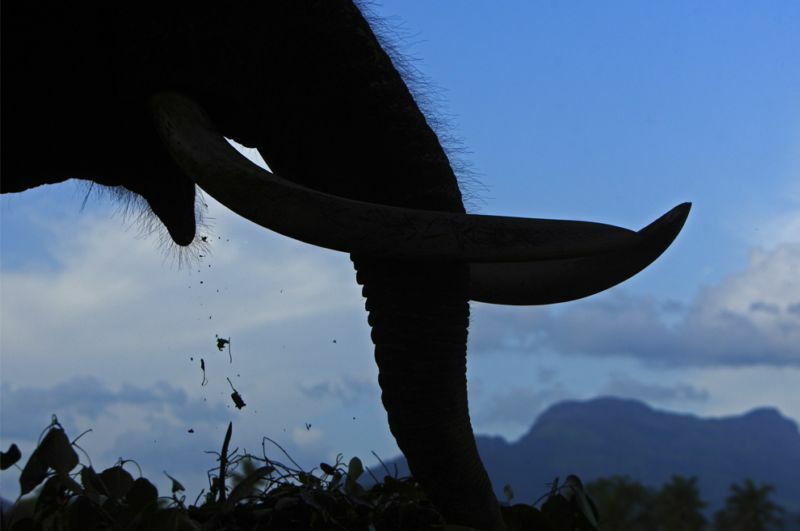 An elephant feeds at an elephant orphanage in Pinnawala The elephant orphanage aims to take care of orphaned or abandoned elephants in the jungles of Sri Lanka. 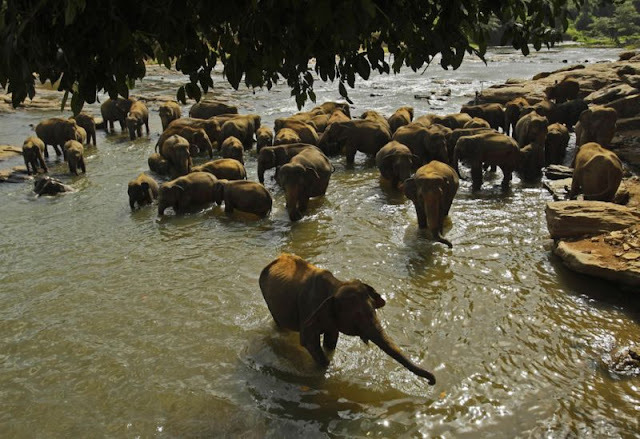 The mahouts, or elephant keepers, feed the elephants and take them twice a day to a nearby river for bathing and drinking water. 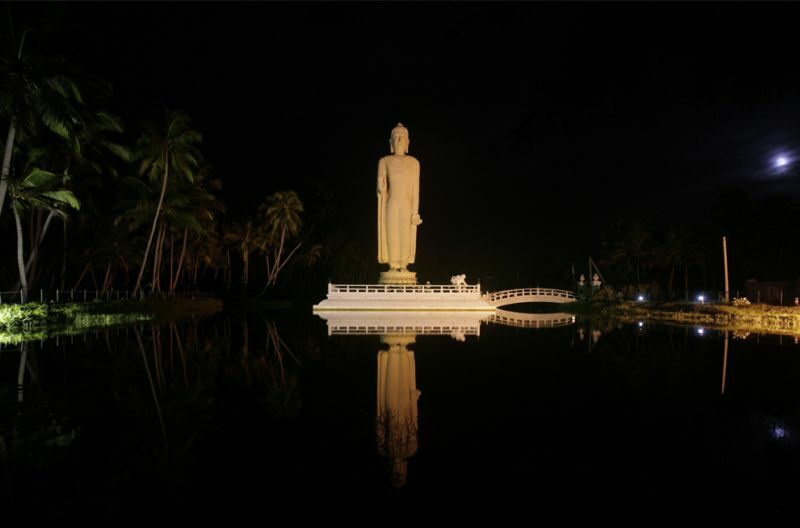 A Buddha statue is reflected in a lake at the Tsumani Honganji Vihara in Peraliya, north of Galle. The statue at the Vihara, along the coast, was built with Japanese assistance after the 2004 Indian Ocean tsunami. 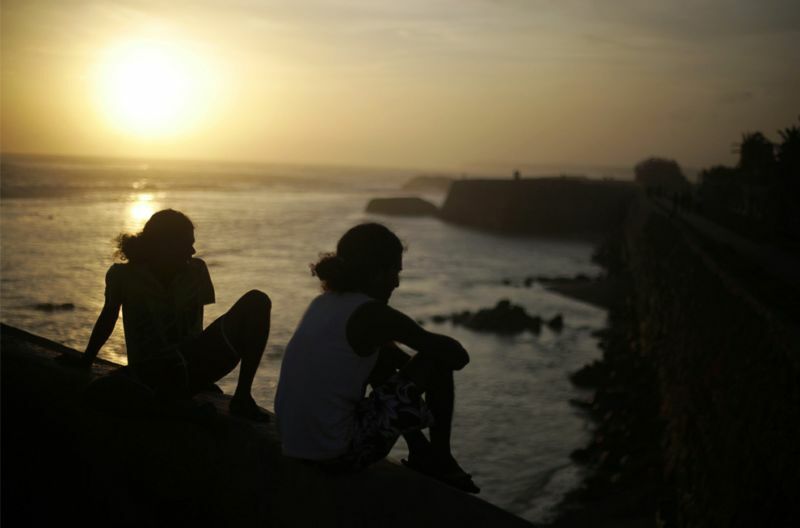 People sit on the edge of a lookout on the walls of a 16th century Dutch fort as the sun sets in Galle. 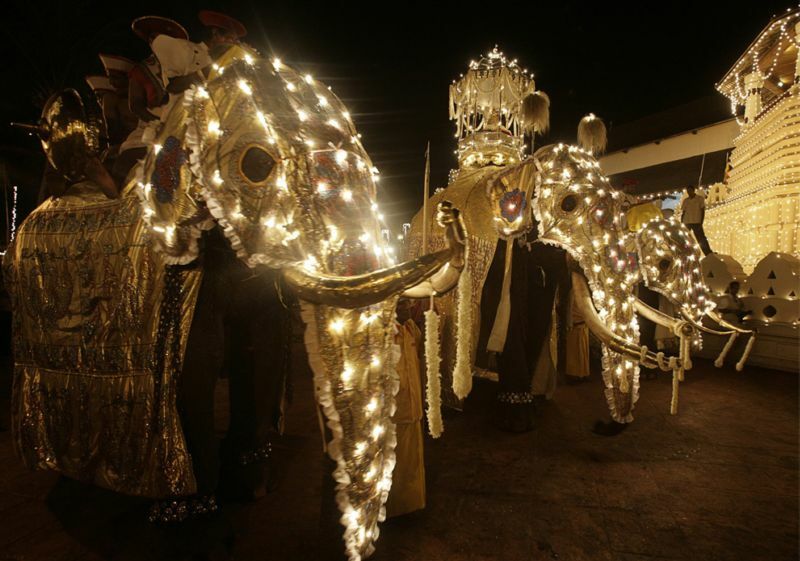 Sri Lankan torch bearers wait for festivities to begin on opening night of the annual Kandy Esala Perahera festival Kandy. 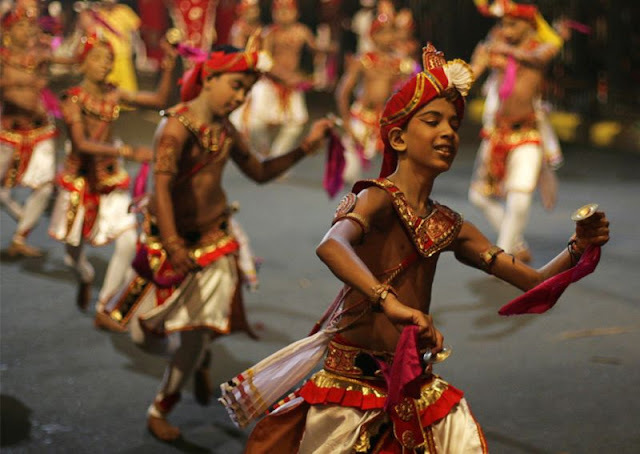 Sri Lankan traditional dancers from Budawatta Dance Troupe perform during the launch of "Meet in Sri Lanka" campaign, in New Delhi, India, Friday, July 31, 2009. 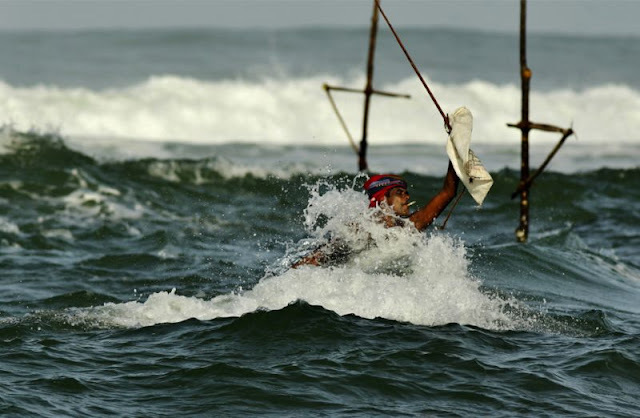 The campaign is launched by Sri Lankan Tourism Ministry and Sri Lankan airlines to attract tour operators and Indian tourists. 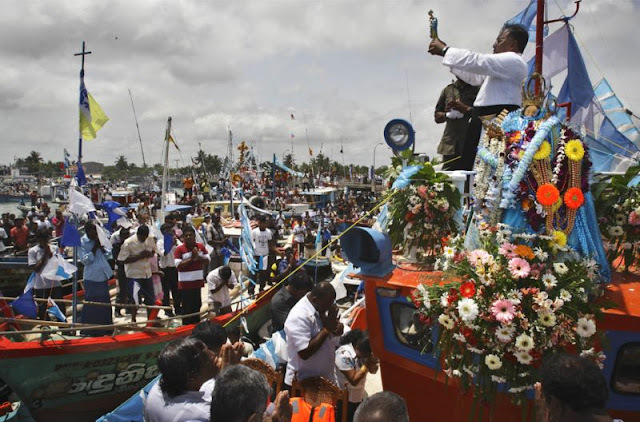 Christian priest holds a small idol of Our Lady of Good Voyage as her main idol lies covered in floral tributes and decorations, right, atop a fishing boat, at a fishing port in Negambo, Sri Lanka, Sunday, July 19, 2009. 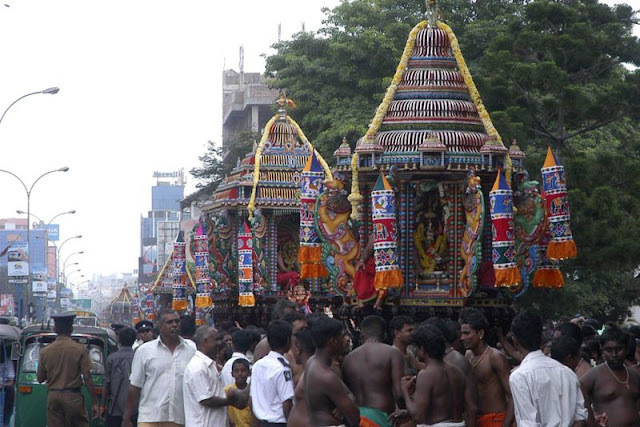 Fishermen of the Christian community take out a traditional annual procession of the Lady of Good Voyage from a local church by foot and then later by boat to the ocean, as an expression of thanks for what the community considers her blessings for safe voyage. 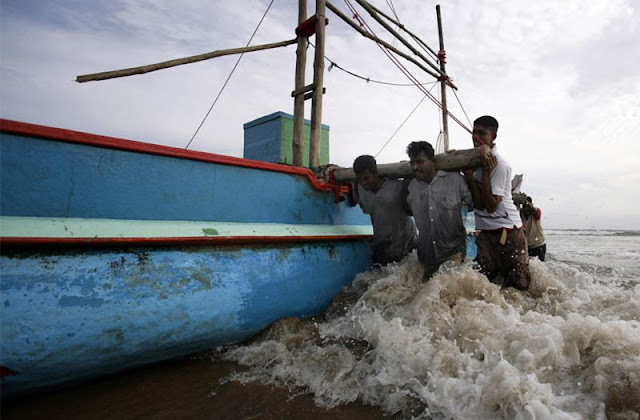 Fishermen push their boat ashore as they use the waves to help them get it onto the beach in Unawatuna. 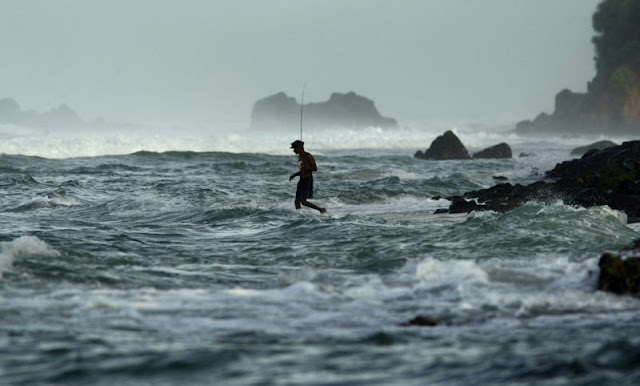 A Sri Lankan fisherman walks into the water in the Koggala area, Sri Lanka.